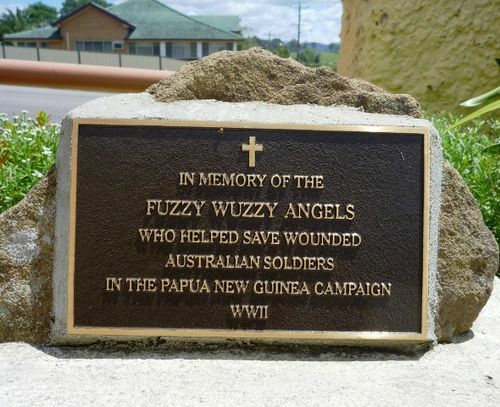 A plaque commemorates the Fuzzy Wuzzy Angels which was the name given by Australian troops to a group of Papua New Guinean people who, during World War Two, assisted and escorted injured Australian troops down the Kokoda trail. "Fuzzy Wuzzy" was originally used by British soldiers in the 19th century as a name for Hadendoa warriors on the Red Sea coast of the Sudan, and referred to their elaborate butter-matted hairstyles. In 1942, the Japanese had built up a force of 13,500 in the Gona region of Papua with the intention of invading Port Moresby. The key to the offensive was an overland track across the Owen Stanley Ranges. The track ranged from the small village of Buna on the north coast of Papua and went up the slopes through Gorari and Oivi to Kokoda. 4000 Australian lives were lost in the campaign, and it is speculated that this number would have been much larger had it not been for the help of the Fuzzy Wuzzy Angels. No known injured soldier that was still alive was ever abandoned by the Fuzzy Wuzzy Angels, even during heavy combat.